Web Exclusive - Flash Sale - Selected Apollo Adult Bikes now only £149.99 - Today Only! There are other bikes as well on a one day special. 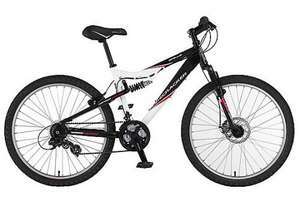 Poor quality , very heavy , add another £150 and get a decent bike that will last . For £350 you can get the voodoo Bantu , hell of a lot of bike for the money , and 5 star reviews everywhere . Oh dear, the bike snobs are out again! They've almost certainly never seen or ridden it. Oh dear, the bike snobs are out again! They've almost certainly never … Oh dear, the bike snobs are out again! They've almost certainly never seen or ridden it. Yes but they list the specification and you can read them to be able to make a informed opinion on the product, for a start it has one disc brake and one V brake. Yes but they list the specification and you can read them to be able to … Yes but they list the specification and you can read them to be able to make a informed opinion on the product, for a start it has one disc brake and one V brake. TBH the full suspension on a 150£ bike here is insane. It will be terrible. No I am not a bike snob. unless these cheapo Apollo brand (not the pro stuff) have changed their ways they are rubbish! I own one of their previous models and eventually had to replace almost everything for it to stop falling apart. If you want to ride this bike then don't buy. If you don't plan to buy often and just want something to take up space then don't buy, get something cheaper when the Tesco type offers come along. You can always just go ahead and buy it, keeps the local bike shop busy with repairs.